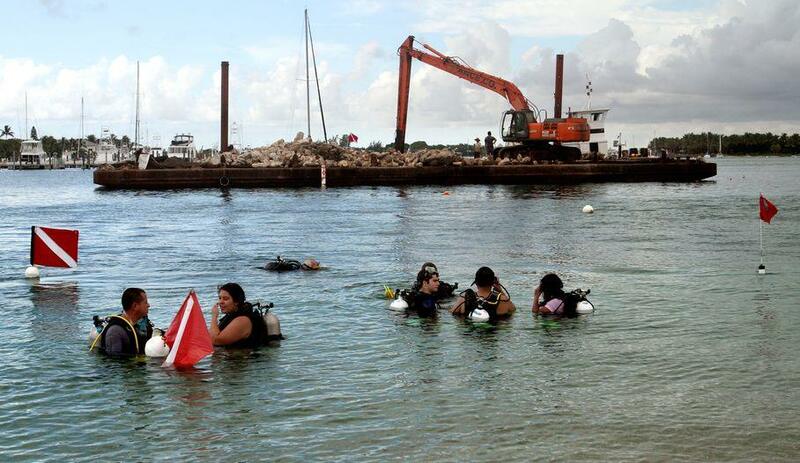 Divers and snorkelers will soon have another sanctuary where they can spot South Florida sea creatures – an artificial reef stretched across 2 acres near Phil Foster Park in Riviera Beach. The reef, mostly made of limestone boulders, will be in 6 to 12 feet of water in the no-boat area just south of the park’s beach under the Blue Heron Bridge. Sandwiched between the beach’s swimming and boating areas, it will provide a refuge not only for divers and snorkelers but also for marine life, Palm Beach County project coordinator Harvey Rudolph said. Seahorses, octopuses, manatees, turtles, a variety of fish and other sea critters have been spotted in the Lake Worth Lagoon water. “You can see stuff here that you normally can’t see except offshore,” he said. Construction started Wednesday, and fish are flocking to the few piles of limestone placed. Once algae encrusts the rocks in about a month, more creatures will inhabit the reef’s ledges, nooks and crannies, he said. The Environmental Resources Management and Parks and Recreation departments are using $87,000 from vessel registration fees to build the artificial reef and underwater trail. There also will be a kiosk west of the park’s lifeguard tower that will show a layout of the trail, offer safety tips and explain some creatures snorkelers are likely to encounter. These manmade reefs are important harbors for marine life, Bates said. There are more than 100 artificial reefs sprawled across the county, most of which were built with money from vessel registration fees. Despite past bacterial contamination problems at Phil Foster Park, Parks and Recreation Director Eric Call said he’s not concerned about putting the reef there. Vessels that were likely causing the contamination were relocated and the water “hasn’t had a poor reading in a while,” he said. The last poor rating the water received from the health department was in January. Call said the abundance of sea life and the park’s easy access and free parking make it a “hidden jewel” and a dive hotspot. “People come from all over the world to dive at that particular spot,” Bates said. Some divers are already looking forward to the new reef. “Anything they can do to preserve and conserve the sea life is great,” said Nelson Chirillo, of West Palm Beach. “And they’ll be more (sea life) to look at,” added his friend Evan Alva, also of West Palm Beach. Chirillo, 30, and Alva, 27, have been diving about three times a week at the park for the past two years. They said they’ve seen everything from octopuses to sharptail eels to hawkfish. “It doesn’t get more beautiful than here,” Chirillo said.